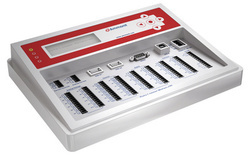 Meteo-40 is available in three configurations - for every application the best suitable data logger. Meteo-40 is designed for high performance and accuracy working at a minimum of power. You can reliably supply a complete measurement system with only a 50 W solar module - even in remote sites under extreme weather conditions. Meteo-40 is the first data logger in the field of wind and solar resources assessment, which includes security features like digital signature and encryption to protect integrity and authenticity of your irreplaceable measurement data! UTMS, GSM, GPRS, CDMA, WiFi; 1 Ethernet port for LAN, router. Ammonit stand-alone measuring systems are reliably powered by a 50 W solar panel. Stored in a CE-certified steel cabinet, the data logger is protected against weather and condensation damage as well as theft and vandalism. Several optional components may be included, such as a communication module, a barometric pressure sensor, a battery and surge protection.